The continued recovery of the global economy resulted in unusually widespread growth in 2004, but a modest slowdown in all regions is expected in 2005, according to projections contained in World Economic Situation and Prospects 2005 (WESP 2005). Developing counties grew at the fastest rate in 2004. In addition to the stimulus provided by the United States, China is making an increased contribution to global economic growth. Its rapid expansion has contributed to increased global demand for oil and many non-oil commodities, with the higher prices for the latter bringing particular benefit to several countries in Africa and Latin America. According to IMF WEO projection, global output growth was estimated at 5 percent in 2004, compared with 3.9 percent recorded in 2003. The advanced economies as a group (with 55.5 percent share in 2003 global output) were projected to grow by 3.6 percent, while the other emerging markets and developing countries as a group (with 44.5 percent share in 2003 global output) were projected to grow by 6.6 percent in 2004 pulled by China. In 2005, global economic growth is projected to decline somewhat from 5 percent expected in 2004 to 4.3 percent as the positive factors are offset by decline in spare capacity and the withdrawal of fiscal and monetary stimulus in advanced economies. Bangladesh economy maintained the growth momentum in FY04 based partly on continuing improvement in macroeconomic performance despite some adverse external developments, notably oil and commodity price hike. Bangladesh is in the process of a transition from a predominantly agrarian economy to a quasi-industrial and service economy. The private sector is playing an increasingly active role in the economic life of the country, while the public sector concentrates more on the physical and social infrastructure. Country’s GDP grew by 5.5 percent in FY04, up from 5.3 percent recorded in FY03. The 5.5 percent real GDP growth in FY04 was underpinned by a steady growth in industrial and services sectors, reflecting expansion in both domestic and external demand. Country’s economic growth was facilitated by robust growth of exports, imports and remittances. In U.S. dollar terms, export earning recorded a growth of 15.9 percent while import payment grew by 12.4 percent. Money grew at 13.8 percent in 2004. Domestic credit grew by 15.0 percent, reflecting mainly growth in private sector credit aided by moderate decline in lending rates. The industry sector attained 7.7 percent growth in FY04, compared with 7.3 percent of FY03. Overall, the services sector grew by 5.7 percent in FY04, m9derately higher than 5.4 percent recorded in FY03. Domestic savings as a percentage of GDP rose from 18.2 OT FY03 to 18.3 in FY04.. Similarly, domestic investment as a percentage of GDP rose from 23.4 of FY03 to 23.6 in FY04. 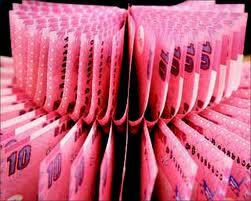 Broad money (M2) growth stood at 13.8 percent in FY04. Robust growth of export, import and remittance from workers abroad underpinned strengthening of country’s external sector in FY04. Exports increased by 15.4 percent from USD 6.5 billion in FY03 to USD 7.5 billion in FY04; while imports increased by 12.6 percent from USD 8.7 billion in FY03 to USD 9.8 billion in FY04. The current account balance exhibited the same surplus of USD 0.2 billion in FY04 as in FY03, supported by a 9.7 percent growth in workers remittances from abroad. The Cash Reserve Requirement (CRR) for the scheduled banks with the Bangladesh Bank remained unchanged in FY04 at 4.0 percent of their total demand and time liabilities. Effective from November 08, 2003, the Statutory Liquidity Ratio (SLR) for the scheduled banks, excepting banks operating under the Islamic Shariah and the specialized banks, was revised downward to 16 percent of their demand and time liabilities. The bank rate was revised downward from 6 percent to 5 percent on 6 November 2003 and remained unchanged thereafter. How the European Union works?